When I first started using C#’s async/await keywords I found it helpful to create a set of notes as I progressed. On this post you’ll find a collection of tips and how-tos. Hopefully others will find it useful. I’m using NUnit as a convenience to step through my test code. As of v2.6.2, NUnit supports unit tests with the async keyword. Beginning with NUnit 2.6.2, test methods targetting .Net 4.5 may be marked as async and NUnit will wait for the method to complete before recording the result and moving on to the next test.Async test methods may return void or Task if no value is returned, or Task<T> if a value of type T is returned. 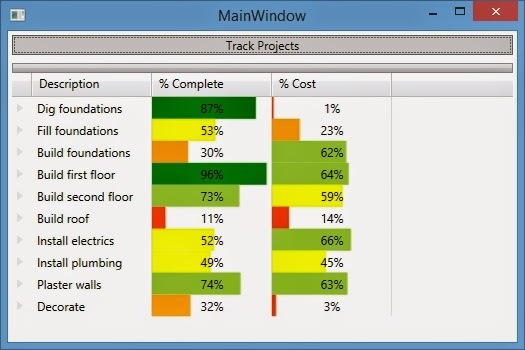 I’ve spent a few days analysing the performance of a C# WPF application. The client’s users were concerned that performance across certain areas just didn’t feel as fast as it ought to be – particularly during busy times of a trading day. That might sound pretty vague, but often as developers that’s all we get. There are plenty of resources available that go into a great level of detail on the best practices to follow when designing apps. It helps to understand what .NET does under the hood, in many aspects, but it’s important to remember that there are many layers in which subtle coding designs can negatively affect performance. I’m going to describe some interesting implementation details which I discovered were the cause of performance issues that the users were complaining about. This particular blog covers structs and how slow Equals calls can be – please see my other blog entry for similar results found by examining the default GetHashCode implementation. 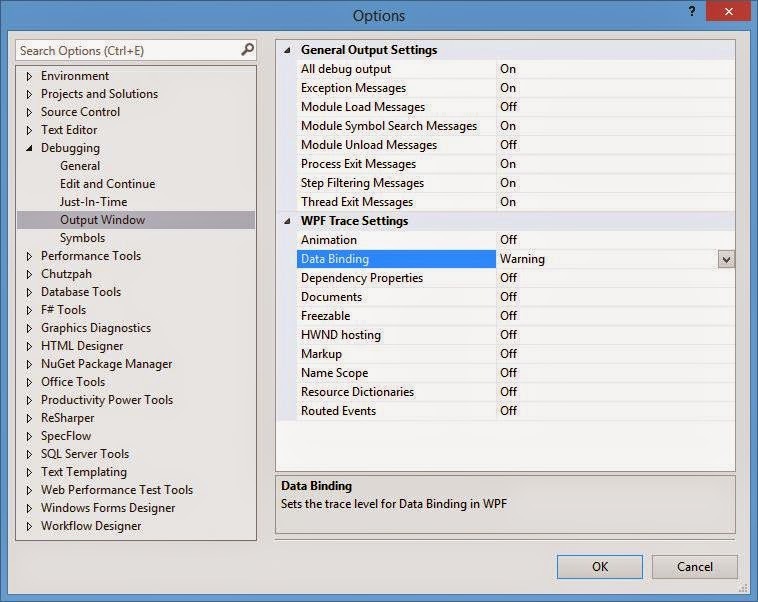 Infragistic's XamDataGrid is a highly customisable WPF control. I'm going to walk through the steps required to display a number of colour-coded fields on a XamDataGrid, where each field is bound to an underlying percentage based property. By default, Visual Studio (v2012 onwards) is configured to automatically log any binding errors detected whilst running a WPF application. Often, it's useful to be notified in a more intrusive manner when a binding error has been detected...rather than silently continuing, just as WPF does. In order to add your own handling, you need to add a class that derives from TraceListener to the PresentationTraceSources.DataBindingSource.Listeners collection. I've been playing around with WPF's CompositionTarget.Rendering event. CompositionTarget.Rendering Occurs just before the objects in the composition tree are rendered.The Rendering event is routed to the specified event handler after animation and layout have been applied to the composition tree. From this event, I've been looked at a way to calculate how many frames are being rendered per second in a WPF application. The act of adding a delegate to CompositionTarget.Rendering might slow your WPF application down...so it's probably best used debugging performance, or as a user configurable options when used in a production environment. My calculations aren't very scientific..but the numbers produced are close to those seen by attaching to the application with Perforator from WPF Performance Suite. This could be handy if a low frame rate is detected, you could log the time stamp (using something like log4net) and compare what was going on in the rest of you app. You've got users complaining that it takes too long for a screen to open or for a certain piece of code to run. Wouldn't it be handy to wrap the execution of a key block of code with some timing statistics? The following TimeIt class is derived from IDisposable which makes it easy to wrap a code block (aka scope) with the using keyword (this will ensure that if any exceptions are raised you'll still get to final end scope logged). This is quite a common scenario, I need to create a source data provider from some type of 'expensive' service, eg a stock market price ticker, which will automatically handle the job of connecting and disconnecting as the number of active observers changes. By 'expensive' we could mean resource-wise expensive, ie amount of memory/ cpu time or financially expensive...perhaps there's a charge levied per subscription. User can open any number of trade entry screens. Subsequent requests to an already subscribed symbol should immediately send back the latest price received rather than wait until a new price arrives.